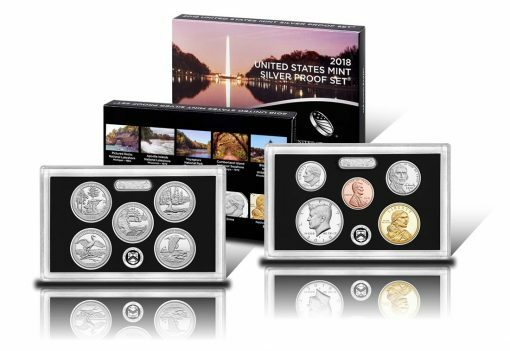 Ten collector-grade coins become available today, April 24, with the United States Mint’s release of the 2018 Silver Proof Set. Coins of the 2018 Silver Proof Set are encased in two protective lenses — one for the U.S. Mint’s America the Beautiful Quarters™, and one for the dollar, half-dollar, dime, nickel and cent. They ship together in a single carton along with a U.S. Mint Certificate of Authenticity. The Washington Monument appears on the front of the carton with the back having photographic images of included coins and honored individuals and sites. The newest version of the annual offering includes proof quality coins produced at the U.S. Mint’s facility in San Francisco. Seven of the coins are featured in a composition of 90 percent silver and 10% copper. That silver composition differentiates this product from the clad 2018 Proof Set which went on sale last month. A CoinNews photo of a clad 2018 Proof Set. 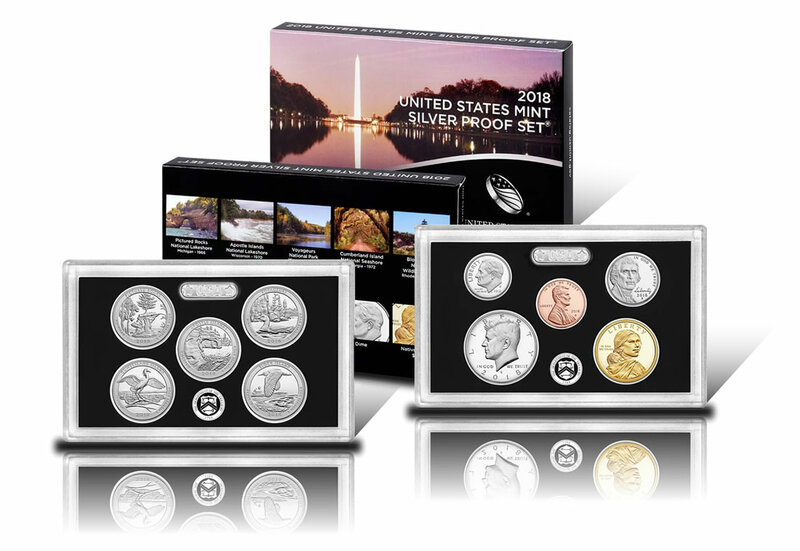 This regular, non-silver set was released on March 6, 2018 for $27.95 and has sales of 201,739 through April 15, 2018. Aside from the composition differences, these same coins are in the 2018 Silver Proof Set. Both sets contain numismatic versions of the circulating coinage of the nation. The seven silver coins combine for a total silver weight of 1.338 troy ounces. That amounts to about $22.20 in silver based on today’s LBMA silver price of $16.595 an ounce. The remaining Native American $1 Coin, Jefferson nickel and Lincoln cent have standard circulating compositions. For comparison, the 2017 Silver Proof Set had an approximate silver value of $23.55 based on market conditions when it was released on June 7, 2017. It is still available and has sales of 342,565 through April 15, 2018. All ten coins of the set showcase a proof finish created by hand-polished coin blanks, polished dies and multiple press strikes. The result is sharper reliefs with mirror-like backgrounds and frosted foregrounds. A CoinNews photo of five 2018-dated quarters. 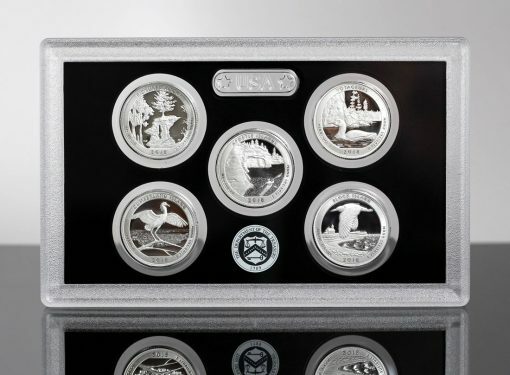 These are silver editions released earlier in the separate U.S. Mint 2018 America the Beautiful Quarters Silver Proof Set™, which is available for $33.95. These same quarters are in the more encompassing 2018 Silver Proof Set that launches today. Designs exclusive to 2018 include the Mint’s five America the Beautiful Quarters® and the Native American coin. 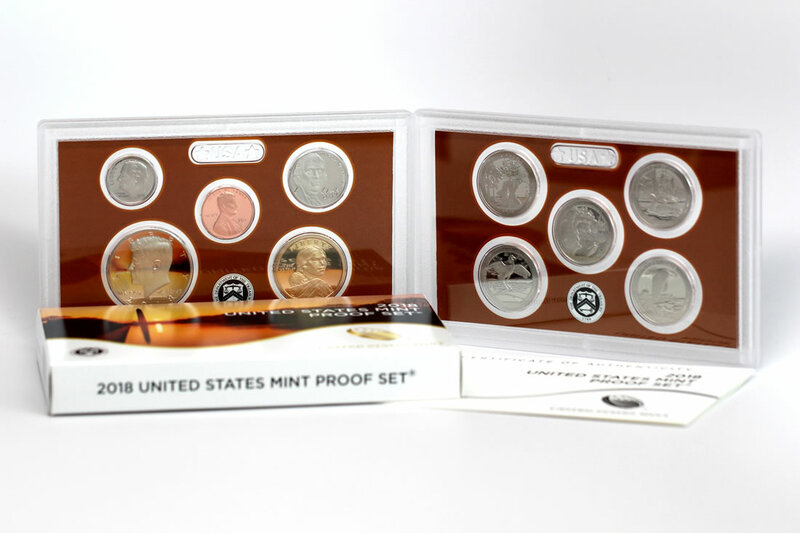 2018 Silver Proof Sets are available directly from the Mint’s website, located here, or by calling 1-800-USA-MINT (872-6468). Pricing of the set is $49.95, an increase of $2 from last year’s release. No mintage, household or ordering limits apply. A new box design would be nice…. The mint should also issue the cent, nickel and dollar in silver for this set. If the argument for not doing so is the historical composition of the coins, then they should at least also do the dollar in silver. The clash with history didn’t stop them from producing a gold half, quarter and dime in 2016, or the gold Kennedy half in 2014.